Tufts veterinary students promote HSVMA at an event. As an HSVMA student member, we help you make connections at school, in the field and online. 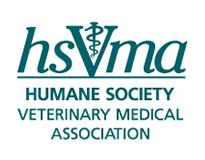 HSVMA's student chapter program helps veterinary students get involved in animal protection issues, promote humane veterinary education, participate in field service opportunities, and network with like-minded students. Also, check out our Student Representative opportunity! Like us on Facebook and connect with other students and veterinary professionals. Check out our recent news stories, hear about upcoming conferences and more. And you post your own links, stories, or pictures, too! HSVMA is also on LinkedIn, providing another venue for you to connect to other veterinary students and professionals.